Democracy was up against the wall in this month’s election. Notwithstanding early exceptions like Frank Capra’s Mr. Smith Goes to Washington (1939), political films became their own genre around the time that television began bringing the images and drama of politics into voters’ lives on a daily basis. From more than half a century of such movies, here are seven lessons we can draw about what’s at stake. Democracy is always coming apart. Unlike totalitarianism, democracy is deliberately designed to be the most clangorous of contraptions, powered by noise and held together by just enough reason brought to bear at the last moment. What’s fascinating about this Otto Preminger blockbuster about life among Washington’s governing class during the confirmation hearing of secretary of state nominee Henry Fonda is how what was shocking six decades ago is now quaint—most notably a gay affair that haunts one senator who’s as tormented as he is idealistic. Start with this picture and yearn for the good old days. Democracy sometimes demands a particularly exquisite moral sense. Not a moral sense that believes anything goes or one that believes nothing goes, but a moral sense that believes in distinctions and when to make them. In the 1860s, in the last months of his life, with half the country at war with the other half, the 16th president of the United States fights to pass the single most important piece of legislation in the country’s young history: the 13th Amendment ending slavery—that asterisk attached to the American dream like a gorged tick. To do so he wheels and deals, cuts corners and fudges truths, and struggles to keep his ethical balance not because any end justifies any means but because some ends justify some means; knowing which is which is the trick of wisdom and leadership. This is director Steven Spielberg’s most perfectly executed movie (which isn’t to say it’s perfect), with an incarnation of Abraham Lincoln by Daniel Day-Lewis that’s as close as we’ll get to seeing what the real man was like. Confronted with the greatest threat to American national security since World War II and the greatest threat to planetary survival ever, the 35th president must decide what to do about Russian missiles in Cuba that have the capacity to take out the U.S. within half an hour. The best of all the screen portrayals over the years, actor Bruce Greenwood’s John Kennedy is bombarded by advice from generals and statesmen to invade the island. But Barbara Tuchman’s definitive World War I history, The Guns of August, had just been published that same year, and so, in the Cuban missile crisis of October 1962, JFK is mindful of how, half a century earlier, countries preemptively overreacted to each other and created a cataclysm that killed nearly 20 million. Along with his brother Robert, Kennedy thinks three or four moves ahead instead of one, and—though generally a more flawed, feckless, and faint-hearted chief executive than hagiography would have it—that fateful autumn he saved the world. The truth matters. Pay attention. I wince almost as much when the press gets on its high horse as when it’s accused of being the enemy of the people, but first-rate reporters are wired to get a story and get it right. The biggest takeaway from these two films about the most formidable challenges to democracy of the last 70 years before the current one—the McCarthyism of the 1950s that sought power through division and demonization and the Watergate scandal of the 1970s in which power acquired corruptly was then abused—is that, as newsman Edward R. Murrow explains, every issue may have two sides, but that doesn’t necessarily mean both sides are equally valid. It also doesn’t render irrelevant the role that facts play in distinguishing between the two sides: Sometimes one side is right and one side is wrong. In the cases of McCarthy and Watergate, it took the press to sort that out and took the rest of us to care. You can’t save democracy by destroying it. A young Reese Witherspoon is the child of the corn born to run for student body president of her high school for the sake of nothing more than being student body president of her high school. The paradox is that it’s conscientious civics teacher Matthew Broderick who, knowing a monster in the making when he sees one, decides he has to subvert democracy in order to save it. The lesson of what remains Alexander Payne’s best movie to date is that discarding our own morality to beat someone who doesn’t have any is a doomed strategy. If she doesn’t become a rogue vice-presidential nominee or a Speaker of the House who reads Ayn Rand, at the least Witherspoon might serve as a White House press secretary who lies to the country on a daily, if not an hourly, basis. Sometimes things are exactly as batshit nuts as they appear. So dig this for a crazy concept: A hostile foreign power on the other side of the world plants a sleeper agent in the American electoral process to sow the chaos that democracy can survive only so long. If that isn’t far-fetched enough, this agent is a child of privilege with a mom complex whose desperation to be loved drives him to ruin the nation that exalts him. What will these Hollywood folks think of next? At the cross-coordinates of surrealist thriller and paranoid satire, released just as Kennedy’s Cuban missile crisis was unfolding, John Frankenheimer’s Cold War fun house of a film was pitched at a level of barely repressed frenzy that knows no ideology. Any resemblance to a Siberian or Ukrainian Candidate in the White House is purely a figment of your insanity. One is the loneliest number. It’s also the number that counts most. Among its ironic and grand contradictions is that this is a thoroughly old-fashioned studio biopic made by an indie maverick about an African American radical living in a time when everything was so buttoned up as to be potentially explosive. With a script originally by an uncredited James Baldwin based on a book by Alex Haley (Roots), Spike Lee went for broke with a three-and-a-half-hour epic about Malcolm Little’s journey from criminal to convict to philosopher to minister to freedom fighter to martyr, with both the man and movie addressing along the way the African American identity in an ostensibly democratic system that still means to freeze African Americans out. 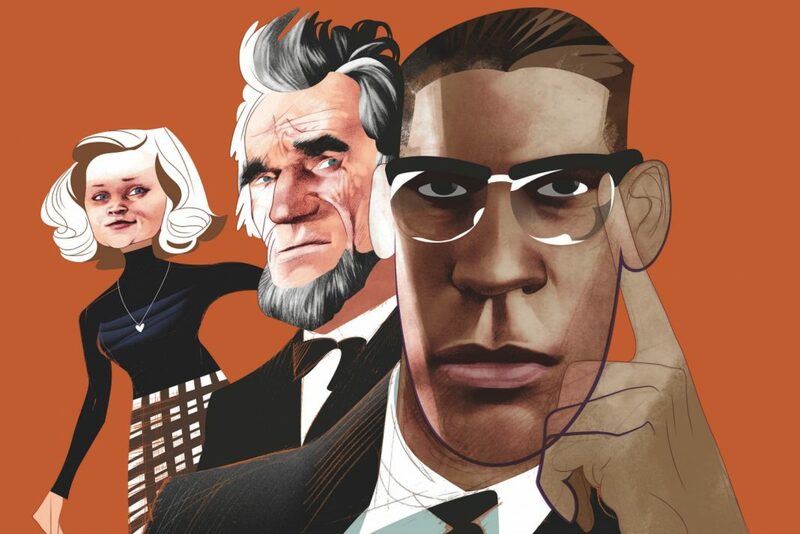 A kind of bookend to Lincoln’s Day-Lewis, Denzel Washington gives a towering portrayal for the ages as Malcolm, one man who counted—as unlikely as it sounds—in the way individuals still count and in the way individuals who are mobilized count even more. Our current politics are what they are because some people made a point of voting in 2016 even when told their extremely dubious candidate couldn’t win and because others—preferring to indulge their moral vanity when the binary choice before them wasn’t more perfect—didn’t vote at all.